It’s always funny looking back at old artwork. This is because I look at it with all of the feelings and emotions I was applying at the time of its creation, yet I’m also looking at it with my more current artistic views. So there ends up being this two-way reading of a work. What I felt then and what I feel now. Which can either be quite paralleled, but more often then not is more of a “what the hell was I doing? !” kind of reaction. It’s sometimes quite amusing to see the difference in the two thought processes. One of the reasons I am so grateful that I’ve made art throughout my life, is that all my works are essentially a document and narrative to my growth and development. Or at least, to my development as an artistic practitioner. It is me expressing myself during a given time period and over the years my drawings have taken on all sorts of forms. These include Beatrix Potter-like creations of animals in clothes, fashion illustrations, running inky portraits, landscapes, sketched copies from the work of Egon Schiele and Michalengelo, life drawing, the list goes on. 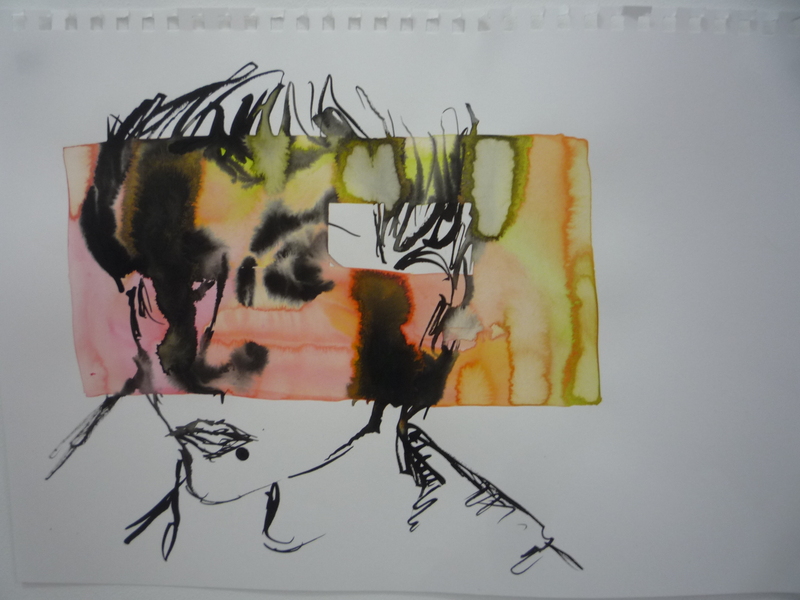 The above image is from my experimental phase with Indian and batik ink. I love the fluidity and seeping of colours, as I never know how a piece is going to turn out, which for me is incredibly exciting. This way of working led onto a whole bunch of ink-based experimentation and essentially changed the way I paint forever, as I still apply dripping and watered-down techniques today. Funny how one thing can lead to another and you never look back!